Start either some Korean ground beef or Chinese ground pork in a saute pan. Also put on a pot of water for the kale. I like kale the best with these ground meats, but I can be flexible in a pinch. By the time you put the meat on the back burner to simmer for twenty minutes, the water should be boiling for the kale. Dump the kale into the boiling water, blanch it for a few minutes, and then drain it. 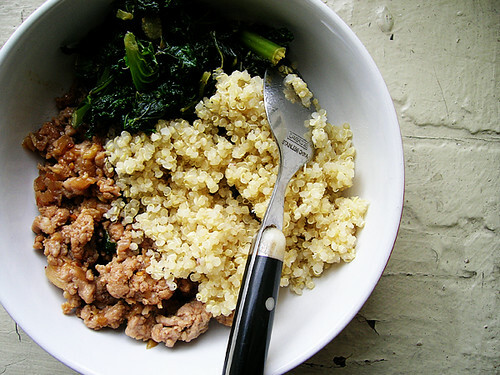 While you're waiting for the meat to be done, you can throw a cup of quinoa with two cups of water into the same pot that you just blanched the kale in. Bring it to a boil, then put it on the other back burner to simmer for fifteen minutes. When the meat is done, put it into its container and throw the kale into the same pan the you just cooked the meat in. If you're feeling fancy you can throw in some chopped garlic, or not. When the quinoa is done, put it into its container. Some time after that, the kale should be done to your liking and put into its container. 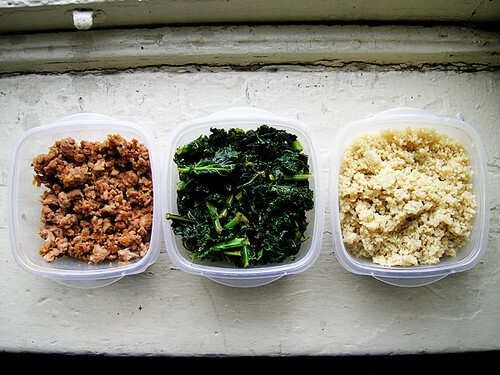 To serve: scoop of ground meat, scoop of greens, scoop of quinoa, don't waste my time. If you're wondering why I always say scoop of this, scoop of that, don't waste my time, it's from City Slickers. It means when something is dead easy.